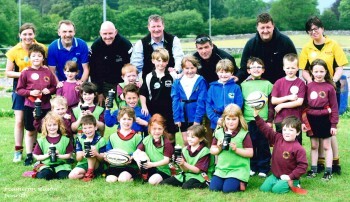 In recognition of the Rugby World Cup being played in England this year, Upper Eden Rugby Club received funding from the Westmorland Limited Fund to invite year one and two children from local primary schools to join in a celebration event. It was well supported with more than 100 six and seven year olds from six different Kirkby Stephen and Appleby area primary schools taking part in a tag rugby fun activity afternoon at Pennine Park. The program was led by coaches from the Upper Eden club, Cumbria RFU and other sports clubs with support from Kirkby Stephen Grammar School young sports leaders. In a grand finale, all children, coaches, volunteers and school staff combined to perform a haka (traditional Maori war dance performed by the New Zealand team).